Sonia’s mother and Sonia’s maternal grandfather, early 1900s. Pictures of Sonia's maternal grandfather and Sonia's mother. Taken in Poland before July 1913. Sonia’s mother, Hinda Leah Dombek, on the right wearing a white long-sleeved blouse in full face. Her sister is in profile at the left. Poland, before July 1913. Sonia and her father in Germany, circa 1930. Sonia with family in Berlin, Germany, circa 1930. Sonia in toy car, circa 1930. Sonia with her parents -- Berlin, Germany, circa 1931. Zysia Pressman at the Men's Clothing Store and Factory. Berlin, Germany, circa 1931. Sonia's brother, Hermann Pressman, in Antwerp, Belgium, June 19, 1933. Sonia with brother, Hermann, in City Park, Antwerp, Belgium, 1933-34. Sonia in kindergarten, Antwerp, Belgium, 1933-34. Sonia with her brother -- Antwerp, Belgium, 1934. Sonia with parents and unidentified sailor, en route to the U.S., April 1934. Sonia with her parents -- Graduation from Cornell University, 1950. The Barrister, the University of Miami School of Law newspaper, of Nov. 8, 1956. Sonia at the Founding of NOW -- Washington, DC, October 1966. Sonia with President Lyndon Johnson, April 11, 1968. Sonia with the Rev. Dr. Pauli Murray and Dr. Bernice (Bunny) Sandler, circa 1965-73. This is from the Archival Collections, Women in the Legal Profession, at the Schlesinger Library on the History of Women in America. In 1988, while on the LEGIS Fellows program on Capitol Hill, Sonia spent four-five months working for the Senate Subcommittee on Labor headed by Senator Howard Metzenbaum. When she left that position to work for Congresswoman Nancy Pelosi, she took this picture with Sen. Metzenbaum. He autographed the picture to Sonia in blue ink, which is visible in this picture on the bottom of her dress but is not legible. (July 29, 1988). Sonia and Ethel Kahn at the wedding anniversary of Joe and Millie Glazer, June 29, 1992. Sonia at Retirement party at HUD -- Washington, DC, 1993. Dr. Ida Davidoff, Sonia, and Mary Eastwood at a Veteran Feminists of American (VFA) event held at the Sewall-Belmont House & Museum in May 1994. Sonia with University of Miami Law School professors -- Coral Gables, FL, 1990s. Sonia with friends -- Sarasota, FL, 1990s. Sonia with Zia Fuentes -- Plainfield, IL, 1998. Sonia at U.S. Capitol, Summer, 2000. Sonia in The Solid Gold Cadillac, January, 2001. Sonia with Anna Kowalska, Piltz's librarian, Piltz Library, Poland, August, 2001. Piltz (Pilica), Poland, (her parents' birthplace) August, 2001. Flanzer Jewish Community Center, Sarasota, Florida, March 17, 2002. Sonia with friends, Sarasota, FL, April 2002. Studio Photograph, Gideon Lewin Studio, NYC, 2003. Sonia at the National Woman's Party Alice Award Gala Reception and Dinner, June 10, 2003. Sonia autographing a copy of Eat First, Washington, D.C., July 22, 2003. Sonia with one of the classes in the Scientific High School in Ostuni, Italy, October 8, 2003. Sonia showing a purse made by Priscilla Snyder, given to Sonia by a friend, March 5, 2004. Sonia at awards program of the American Immigration Law Foundation, March 18, 2005. Sonia at the International Association of Yiddish Clubs (IAYC) conference, June 2-5, 2005. Sonia with Tipper and Al Gore, Alice Paul Award Reception, September 20, 2005. National Woman's Party reception and dedication ceremony for Marty Langelan, May 7, 2006. Sonia at her birthday dinner, Normandy Farms restaurant, Potomac, MD, May 30, 2006. Sonia at the dinner party in connection with the 50th reunion of her law school class Mother's Day weekend, 2007. Sonia with her friend, Barbara Quanbeck, Bozeman, MT, July 28, 2007. Sonia during her 12-week CLEA (Citizen’s Law Enforcement Academy) course, Fall, 2007. Sonia during her visit to Cornell University, April 7 - 10, 2008. Sonia at wedding of Michael Fein and Arnold Hanna, Montreal, CA, August 31, 2008. Sonia gives three speeches at Cornell University, April 22, 2009. Sonia close shot at Cornell University, April 22, 2009. Sonia and Judy Helgager, Sarasota, FL, celebrating the 43rd anniversary of NOW’s founding, June, 2009. Photos of Sonia's trip to Christ Church and St. Hilda’s College, Oxford; London; and Cardiff, Wales, from July 6-24, 2009. Sonia and friends, Sarasota Hyatt Hotel, celebrating the 89th anniversary of women's suffrage, August, 2009. Sonia and Ina May Gaskin at Simon's Coffee House in Sarasota, FL, October 30, 2009. Sonia with Representative Keith Fitzgerald, Sarasota Hyatt Regency Hotel, FL, November, 2009. Sonia with friends at Sol de Espana Restaurant, Rockville, MD, November 10, 2009. Sonia at a country club luncheon in Sarasota, FL, November 17, 2009. Sonia with feminist activist Sally Lunt at Red Elephant Restaurant, Bradenton, FL, February 21, 2010. Sonia with friends at a cocktail party at Miguel's restaurant, Siesta Key, FL, February 21, 2010. Herbert Schiff’s 90th birthday party, the Glenridge, Sarasota, FL, February 26, 2010. Sonia with friends at Lake Osprey Cabaret, Bradenton, FL, March 14, 2010. Sonia with former mayor of Sarasota, Lou Ann Palmer, Sarasota, FL, March 21, 2010. Sonia celebrating her birthday, May 30, 2010. Sonia at the Chautauqua Institution, June 27 - July 3, 2010. Sonia at home in Sarasota, July 5, 2010. Sonia with Sondra Seba Hemenway, Sol De España restaurant, Rockville, MD (July 2010). Sonia at the Kreeger Museum, Washington DC, March 15, 2011. Sonia at her great-great niece Rebecca’s bat mitzvah at the Crystal City Hilton in Virginia on March 12, 2011. Sonia with friends in Washington, DC, March 13 - 16, 2011. Sonia at the Second Annual Jewish Film Festival, Sarasota, March 28, 2011. Sonia enjoying Elderflower Presse from the UK with Patsy and Debbie. April 4, 2011. Sonia with Steve Schwartz and Sue Klein at the annual NOW conference, Tampa, FL, June 25, 2011. Courtesy of N. Jerin Arifa. Sonia with Jerin Arifa and her husband, Micah Bochart, at the annual NOW conference in Tampa, June 25, 2011. Sonia at American Jewish Committee Lunch and Learn program, Sarasota, FL, July 2011. Sonia at the Atheneum Hotel, Chautauqua Institution, Chautauqua, NY, July 25, 2011. Sonia with Anat Hoffman, Israel’s leading fighter for women’s rights and progressive Judaism, Chautauqua, NY, July 28, 2011. Lunch at Gabriel’s kosher restaurant in the Jewish Community Center in Berlin, Germany, September 9, 2011. Congregation for Humanistic Judaism, Nov. 5, 2011. With Jordan Land, campaign manager for a candidate for the Sarasota County Commission, Democratic Club of Sarasota luncheon, Laurel Oak Country Club, Nov. 12, 2011. Champagne reception after My Fair Holiday concert, Asolo Theater, Sarasota, FL, December 20, 2011. Holiday luncheon for Sonia’s water exercise class at the Y, which she arranged at Sam Snead’s restaurant, Dec. 20, 2011, Sarasota. Sonia gave a talk at the Al Katz Center for Holocaust Survivors & Jewish Learning at its Sarasota offices in the 2012-15 time period. Panelists (including Sonia), moderator, and WEDU-TV representative on January 31, 2012, at the University of South Florida—Sarasota campus after the showing of the documentary film, Daisy Bates: First Lady of Little Rock. Sonia with Rabbi Jonathan Katz of Temple Beth Israel, Longboat Key, Fl, and Countess Eva Kendeffy, head of the German Consulate General in Miami, FL, on Feb. 23, 2012, after Sonia’s talk at the temple about her Sept. 2011 trip to Germany. Baby shower at Sonia’s water exercise class at the Frank G. Berlin, Sr., Y, Sarasota, FL, Mar. 8, 2012. Sonia with several members of the UN Women/USNC Gulf Coast Book Club at the Broadway Bar, Sarasota, FL, July 11, 2012. Sonia with Georgie Angones, Assistant Dean, Alumni Relations & Development, University of Miami School of Law (Sonia's alma mater), and her husband, Frank, former president of the Florida Bar, at Inkanto Restaurant, Sarasota, FL, Aug. 1, 2012. Sonia with Madeline Poole at Treviso's restaurant in Sarasota, FL, Aug. 6, 2012. Reception (followed by dinner) Sonia had on Sept. 13, 2012, at Inkanto restaurant in Sarasota. Sonia with two leaders of the American Jewish Committee in Sarasota (Sue Jacobson and Brian Lipton) and two representatives of UnidosNow, a Hispanic organization in Sarasota (Frankie Soriano and Manuel Chipote), at Inkanto’s restaurant in Sarasota, Sept. 21, 2012, at a luncheon arranged by Sonia to introduce representatives of the two organizations to each other. Sonia at party of Sarasota-Manatee NOW chapter, Sept. 23, 2012. Sonia with Madeleine Poole at Owen's Fish Camp restaurant in Sarasota, FL, Sept. 27, 2012. Sonia at Veg Restaurant in Sarasota, Oct. 2, 2012, alone and with Mom Luang Rajadarasri Jayankura, a Thai princess, who is seated next to her. The princess is the great-great granddaughter of the king depicted in The King and I.
Sonia at lunch at the Bankgok restaurant in Sarasota with Thai Princess Mom Luang Rajadarsasri Jayankura (right) and her friend, Kathy Baiamonte, October 12, 2012. Sonia at a coffee-and-cake get-together at the Sarasota home of Patsy Rains; her sister, Annette Elrod and Ann Corcoran, Oct. 17, 2012. Thanksgiving Day dinner at the Polo Grill in Lakewood Ranch, FL, with Luz Corcuera and Madeleine Poole, Oct. 22, 2012. Sonia giving a talk on the women's rights movement and the problems that remain at the Cornell University School of Law, Oct. 24, 2012. Sonia with Marty Glucklich, the owner and chef at Veg, Sonia's favorite Sarasota restaurant now that she's a vegetarian, Nov. 16, 2012. Observer Newspaper, American Jewish Committee (AJC) Open House, Sarasota, FL, Jan. 10, 2013. Sonia with Ben Terner, a classmate at the University of Miami (FL) School of Law, Empress Garden Restaurant, Bradenton, FL, Feb. 26, 2013. April 6, 2013. Sonia speaking to the Congregation for Humanistic Judaism at the Unity Church in Sarasota, FL, about her trip to Germany in Sept. 2011. April 22, 2013. Sonia with members of Miami Law Women, University of Miami School of Law, after her talk to that group. Countess Eva Kendeffy, Consul General of the Federal Republic of Germany in Miami, and her husband welcoming Sonia at a buffet supper and piano concert the Countess hosted in the courtyard of the Ringling Museum of Art, Sarasota, FL, April 26, 2013. Luncheon of the American Jewish Committee, Michael’s on East Restaurant, Sarasota, FL, June 26, 2013. Sonia with friends Madeleine and Colette at Treviso's Restaurant in Sarasota, July 13, 2013, and October 28, 2013. Sonia, on the occasion of her giving a speech on women’s rights to the Sarasota-Manatee chapter of Phi Beta Kappa, Venetian Golf & River Club, N. Venice, FL, Dec. 14, 2013. On the right is Johnnie Bohannon and on the left Pam Stewart. Memorial luncheon at Libby’s Restaurant in Sarasota that Sonia arranged for her late friend, Joan Froede, on Feb. 23, 2014. In the center picture, Sonia is shown with Joan’s two daughters, Kirsten and Wendy, who came from NYC for the luncheon. Dinner at P.F. Chang’s in honor of the visit to Sarasota of Judy Norsigian (wearing glasses), executive director of Our Bodies Ourselves in Boston, February 24, 2014. Next to Judy is Luz Corcuera, who is with Healthy Start of Bradenton, FL and next to Sonia is Miriam Wallace, head of Gender Studies at New College of Florida. Sonia at the entrance to the Salvador Dali Museum in St. Petersburg, FL with a tour group from the Jewish Federation of Sarasota-Manatee and at lunch with two members of the group at the Hilton Hotel after the tour. Mar. 19, 2014. Sonia with Agnes, her friend and neighbor, at the seder of the Congregation for Humanistic Judaism at Michael’s on East, April 15, 2014. Sonia, celebrating the 70th birthday of her friend Johnnie Bohannon (seated next to Sonia) at the Social Eatery & Bar in downtown Sarasota. Sonia with Liz Alpert, Sarasota attorney, at Taste of Asia restaurant, Sarasota, May 27, 2014. Sonia with friends at the reception and opening night of The Dixie Swim Club, The Players Theater, Sarasota, June 12, 2014. Sonia with her friends, Johnnie (center) and Madeleine at McCurdy’s Comedy Club in Sarasota, July 20, 2014. Sonia at the Women's Equity Day Luncheon celebrating the 94th anniversary of suffrage, Sarasota Regency Hyatt Hotel, New College of Florida table, July 26, 2014. The man in the picture is Donal O'Shea, president, New College of Florida in Sarasota. Sonia at the going-away party on July 28, 2014, for her friend, Luz Corcuera, who left the Healthy Start Coalition of Manatee County in Bradenton, FL to join the Florida Department of Health in Manatee County, also in Bradenton. Sonia with her friends, Ellen Shaffer and Joe Brennan, after her arrival in San Francisco on Sept. 15, 2014, to give a talk at Mills College in Oakland. They are at the beach of the Pacific Ocean and behind them is the San Francisco fog. Sonia before her talk in the auditorium of Mills College in Oakland, CA on Sept. 17, 2014. 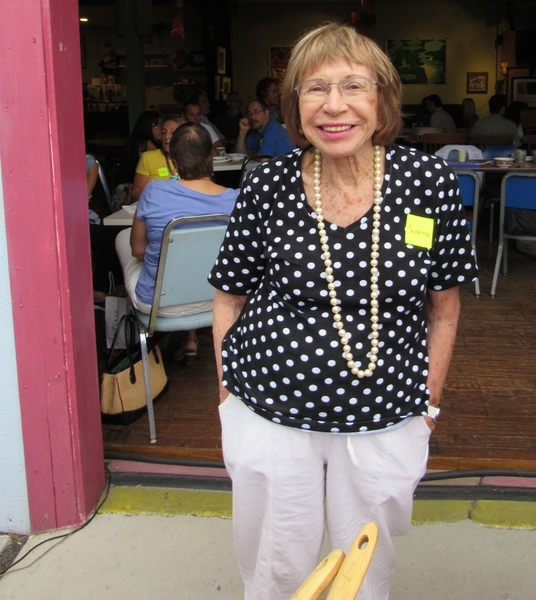 Sonia at the Death Cafe (an organization of people who get together to discuss their views on death and dying) in Sarasota, Sept. 20, 2014. Sonia with Rev. Steven Baines, national spokesperson on issues of faith and politics for Americans United for Separation of Church & State (AU), on the occasion of Reverend Baines’s talk, The War on Religious Freedom: The Religious Right’s Bogey Man, at the Selby Library, Gelbart Auditorium, Oct. 11, 2014. Sonia with her friends, Ellie, Marshall, and Susie after dinner at Karyn's on Green in Chicago, Oct. 23, 2014. Sonia at lunch with Elinor Borenstine at the Thailand Restaurant in Sarasota on May 27, 2015. Elinor, who is 94 years old and a Sarasota resident, is the daughter of Eddie Jacobson, President Harry Truman’s partner in the haberdashery business in Kansas City, MO, and his lifelong friend. Jacobson played a role in Truman’s recognition of the state of Israel. Two photos taken after Sonia gave a talk on June 16, 2015, to WIN (Women in Nielsen) at Nielsen's largest facility in the world, in Oldsmar, FL. The company, which studies consumers in over a hundred countries, has over 2,300 employees at Oldsmar. Sonia at a program on the Ravensbrück Archive at the Jewish Federation of Sarasota-Manatee on June 30, 2015. Picture taken at the Florida Studio Theater (FST) cabaret on Nov. 13, 2015, in Sarasota. Sonia and other members of the Congregation for Humanistic Judaism (CHJ) went to FST to hear an interview of playwright, Rich Orloff (the tall man standing in the picture), by FST actor and director, Jason Cannon. The CHJ members in the picture are part of a group that will be doing readings of some of Mr. Orloff's humorous plays with a Jewish flavor at CHJ on Dec. 5, 2015. Sonia at the Sarasota, FL vegan meetup group's Thanksgiving potluck dinner, Fogartyville Community Media & Art Center, Nov. 15, 2015. Sonia received these two photographs from Patricia Bell-Scott, author of the 2016 book, The Firebrand and the First Lady: Portrait of a Friendship: Pauli Murray, Eleanor Roosevelt, and the Struggle for Social Justice. Sonia with Bishop Bridget Mary Meehan, who is with the Association of Roman Catholic Women Priests, at Sweet Tomatoes restaurant on South Tamiami Trail in Sarasota on May 28, 2016. Picture of Sonia taken on the grounds of the University of South Florida, Sarasota-Manatee, June 24, 2016. Sonia at two events where she spoke in Greensboro, N.C., Aug. 30 and 31, 2016. Sonia seated next to her feminist friend, Tobe Levin von Gleichen, at Sol's NYC Deli in Sarasota at lunch on Sept. 25, 2016. Tobe was visiting Sarasota from her home in Frankfurt, Germany. Across from Tobe and Sonia are Tobe's sister and cousin. Sonia at High Tea at Spanish Point in Sarasota with the Cornell Club of Sarasota, Nov. 3, 2016. Sonia doing a play reading of The Best Man with the Asolo Theater Play Readers at the Asolo Theater in Sarasota, FL on Nov. 9, 2016. Sonia at a luncheon of the Cornell Club of Sarasota at Michael's on East restaurant. Nov. 10, 2016. Sonia with Minnah Stein, her 16-year-old feminist friend who is a student at the Pine View School for the gifted in Sarasota, at lunch at Taco Jalisco in Sarasota, following Sonia's talk to the Holocaust Studies class at Pine View. Nov. 21, 2016. Sonia at the Cornell Club's luncheon at Michael's on East in Sarasota, FL. Dec. 8, 2016. Pictures taken in 2016 in the Washington, D.C. area sent to Sonia by her friend, Nancy Goldberg. Sonia and her friend and mentee, Minnah, at Sonia's condo, Mar. 19, 2017. In June 2017, Sonia donated a wooden hanger from her father's men's clothing store in Berlin, Germany to the US Holocaust Memorial Museum in Washington, D.C.
Sonia at the first People's Supper held in Sarasota, which Sonia arranged, on the evening of Sept. 4, 2017. Sonia with her friend, Lisa, Ginza Restaurant, Sarasota, FL, Nov. 5, 2017. Picture of Sonia with the Ladybugs after Sonia spoke to them on the evening of Jan. 11, 2018, at the Rectrix Aerodrome Center on the grounds of the Sarasota-Bradenton Airport. The Ladybugs are the local chapter of the Ninety-Nines, the international organization of women pilots formed in 1929. On Mar. 10, 2018, Sonia had lunch with Sister Maureen Kelleher and members of the Sarasota-Manatee chapter of NOW, after hearing Sister Kelleher speak about her work. Sister Kelleher, a nun and attorney, works for the Legal Aid Society of Collier County, FL to help undocumented immigrant farm workers in Immokalee, FL secure the legal right to remain in the U.S.
Sonia at a Jung Society film showing at the Community Foundation in Sarasota with her Cornell classmate and Sarasota friend, Jo-An, on April 13, 2018. Sonia with her friends, Colette and Johnnie, after seeing the last performance of Roe, at the Sunday matinee on April 15, 2018, of the wonderful play by Lisa Loomer, about Roe v. Wade at Sarasota's Asolo Theater. Sonia with her friend, Rhana, at the musical, Soul Man, at Sarasota's West Coast Black Theatre Troupe (Apr. 28, 2018). Sonia with her longtime friend, Dr. Bernice "Bunny" Sandler (known as the Godmother of Title IX), at Bunny's condo at the Van Ness Apartments in Washington, D.C. on May 6, 2018. Dr. Bernice "Bunny" Sandler, known as the Godmother of Title IX, holding up a picture of her with Sonia, taken on May 6, 2018, at Bunny's condo in the Van Ness Apts. in Washington, DC, when Sonia visited Bunny with Sonia's great-niece Debbie and her Sarasota friend Colette. Sonia at her 90th birthday party at Café Baci in Sarasota standing next to her great-niece (her brother Hermann's granddaughter), Debbie, with other friends. Sonia, with a small group from her vegan meetup group, having lunch on Sat., June 9, 2018, at Rico's Pizzeria & Pasta House, which has vegan cheese, at 1902 Bay Road in Sarasota, FL. Sonia with her friends/neighbors, Terry and Darlene, at The Meadows annual holiday party at The Meadows Community Center in Sarasota, FL on Dec. 2, 2018. Sonia with her friends, Zheng Baoyi (Baoyi is his first name), and his wife, whose first name is pronounced Shawshan, in front of Sonia's condo in Sarasota, FL, on the early afternoon of Dec. 11, 2018. Sonia met Baoyi in early 1993 when she visited a cancer institute in Beijing, China of which he was deputy director. Sonia with her friend, Colette, celebrating Colette's Dec.10 birthday on Dec. 27, 2018, at the Acropolis Greek Taverna in Lakewood Ranch, FL. Sonia at Sarasota's annual Democratic Kennedy-King Dinner with her friend, Kelley Rae, and the principal speaker at the dinner, Congresswoman Val Demings from Orlando, FL, on Feb. 24, 2019. Sonia with her snowbird neighbors from Brandon, Manitoba, Canada, Terry and Darlene on February 24, 2019. Sonia at the newly-opened Lemon Tree Kitchen in Sarasota on Mar. 24, 2019, where she took her friend, Nancy, to celebrate Nancy's birthday. Sonia's trip to Russia, July, 2004. Some, but not all, of the pictures in this slide show have captions that identify what is in the picture. When you click on a picture, you will see an enlargement of it and to the right of the picture you will see a caption that identifies it. If that caption does not appear, it may be because that picture does not have a caption, but it may also be because you have to do the following for the caption to appear. On the left-hand side of the upper tool bar against a white background, there is a lower-case "i" in a circle next to an arrow. Click on that "i" and if that slide has a caption, it will appear to the right of the picture. Once a caption appears for one picture, it will appear for all and you do not have to click the "i" again. When you want to exit that picture, click on the arrow to the left of the"i." To enlarge any picture and see its caption, if it has a caption, please follow the directions in the entry for the Christ Church slide show immediately before this entry.